One of the themes of our kitchen renovation has been that "we're thrilled" with the results. I can't stress just how genuine this feeling is. We're not "thrilled" like the guests on an HGTV reality show where they just redid a room by putting live moss all over the walls, or like the homeowners are when the guest designers just spray painted a family heirloom. Oh no, we're actually thrilled with what our kitchen now looks like given what it started as (remember, green laminate counters, bad appliances, etc. ), and where it is now. All of that "thrilled" being said, that doesn't mean we don't have opinions on the various aspects of materials, appliances, and finishes we chose. Today I want to take a few minutes to give everyone my opinions on our butcher block counter tops from IKEA, just in case someone is considering using this for their own purposes. Warning: I'm going to be brutally honest here. It doesn't mean we don't like the product, because we do like it, but I did notice a few items I wish I had known going into the project. We began considering the use of IKEA counter tops after seeing it in quite a few blogger projects around the Internet, and after a few commenters here and on our various other social media profiles suggested (ahem, insisted) we give it a look. When we began researching, we were lured into the behemoth of Scandinavian delight by the excellent prices being offered on the website. Walking in we were of the mindset that we could pick up new counters for the whole kitchen for about $120. A specific option was on a closeout sale at just $60 per eight foor section. But once we actually started to put our materials list together, that price quickly escalated. The cheap stuff was beech wood in the thin cut of only 3/4", but we realized we were more interested in the thicker, 1-1/2" profile, and the color of the more expensive oak would look much better in our kitchen. Instead of new counters for $120, we ended up with new counters for around $400. Though $400 was a great price, it wasn't quite as low as we were anticipating. We did shop around at a few other places, such as Lumber Liquidators, a mill I like in Ohio called Baird Brothers, and a few local retailers, but all were considerably more expensive. Since this project is ultimately a "temporary" solution, we were sticking with the cheaper option, even though it came with a bit of compromise. Once we finally got to unpacking the counters, we were happy with the overall quality of them. They were not perfect, as I was able to pick out several areas of wood filler on the nicer top side of the counters, but given the type of wood and price, we were willing to accept these imperfections. One major problem I uncovered during my unpacking of one of the large pieces was this rather huge crack. It started at the end of the piece and extended a good foot into the material. I'm not sure what caused it, but we were luckily able to situate our cuts to eliminate this split. I'm sure IKEA would have gladly exchanged the item, but the last thing I wanted to do was to pack up the piece in the car and waste three hours driving down to IKEA, exchanging the broken piece, and coming back home. No thank you. Another issue that we ran into was something I mentioned in another post. We had long planned on adding a routed decorative edge to the counters, but I was rather disappointed when I uncovered a hole in the front edge of the wine bar while routing the edge. Looking at photos of the area that I was cutting you can see evidence of the knot, but it looks like it was just turned to the inside and partially filled with glue when the whole thing was assembled. I had to get creative with wood filler to get it looking ok, and it will always look a little off, but it's not the worst thing in the world. I just wish I had been a little luckier and chosen that edge as the back edge rather than the front. The final minor annoyance with the butcher block material that IKEA provides has to do with its construction. The edges of the butcher block are finished with solid 1-1/2" bands of oak, and they look good and solid (except for the hole we hit). But once you get inside the outer band of wood and end grain pieces, the whole thing is just laminated and finger jointed lumber. 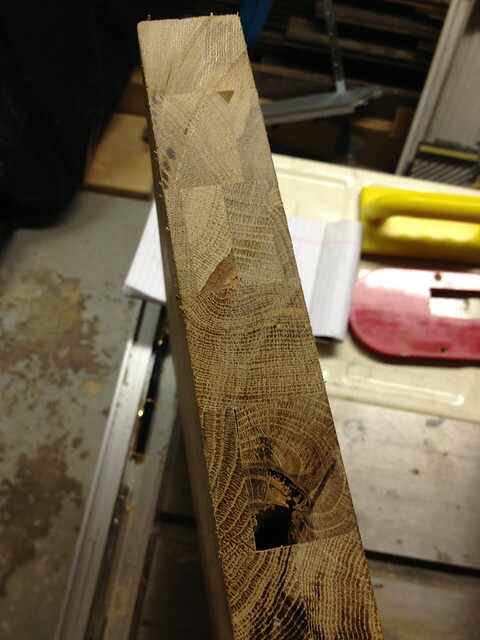 Take a look at this excess cross section that I cut out of the right 1/3 of one of the eight foot pieces of counter. You can see the middle section is sometimes even comprised of two thin pieces on the top and bottom, and one or even two thick pieces of a lower quality wood in the middle. You can also see a significant hole left from a knot. Luckily, I didn't end up with this on an edge, but had I run into that on a final cut, I would have been pretty upset. On one hand, this construction makes the material far less expensive to manufacture (hence the lower prices) by using less wood, lower quality wood, and excess wood in the construction. It can also make the end result more dimensionally stable since two pieces are less likely to warp against each other. 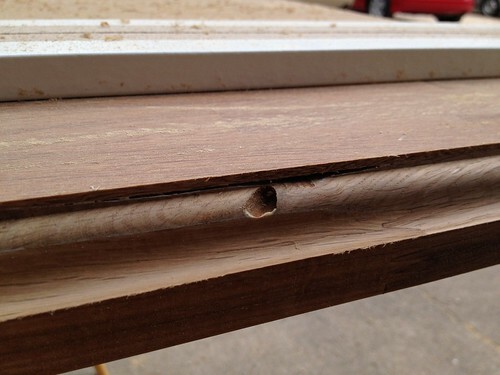 But when the product is advertised as "can be cut, sanded, drilled..." It should clearly outline this aspect of construction as it impacts the installation. I made the cut at the right side of the longest length of counter not knowing this, and I exposed this mishmash of wood. If I had known about detail I would have been able to make a better cut plan that would have allowed me to situate the right end of the counter at the end of the piece, making use of the solid end grain. The other major problem with this construction is the possibility of a hitting a poorly chosen excess piece for lamination. This happened to us, and we didn't realize it was even there until we had assembled and installed the whole thing and began our finish sanding process. Murphy's law, the imperfection showed up absolutely front and center in the middle of the longest piece of counter top. Though most will never notice, the perfectionist in me stares at it every day. It looks like a small piece of oak was damaged and epoxy filled. After sanding, the epoxy/resin filling started to show. Now we have that white spot to the right of the sink. Again, had I known of this possibility and seen it I would have spun the piece around and that imperfection would have been either hidden or cut out of the final piece. Here it is from another angle where you can barely notice it. I'm not sure if the other materials from different suppliers are any different, so if anyone knows I'd love to hear. Though I would have preferred the counters be solid throughout, and that I would have known of the potential issues I was facing (but I didn't see anyone really mentioning this online when doing our research) I would have been better prepared to handle the minor adversities in the project. However, I do have to remind myself that we chose the most economical approach, and you do often get what you pay for, especially when dealing with a natural resource that varies in price from the low to high quality products. For us, this is also a temporary solution, so it would have been foolish to go a more expensive route. Though I'm sure this post may sound like I'm upset or don't like the product we purchased and installed, I'm actually quite happy with how consistent it was, how easily it was to work with (I mean, easy for a nearly 200 pound piece of wood), and how great it all looks when installed. In other words, I'm being nit picky here, but I feel like too often blogs will point out all of the quick and easy DIY aspects of a product or material without really talking about the drawbacks for fear they will make themselves look less competent. At this point, I'm secure enough in my own ability to accept the fact you could possibly think I'm a stumbling buffoon. After all, isn't the Internet primarily for celebrating the stumbling and bumbling buffoon? I think we can all agree on that. Regardless of the points I covered above, the counters look great in our kitchen and we would absolutely buy them again. The only change I would make would be to more thoroughly inspect the counters at pickup, as well as before making any cuts. I'd also try to arrange my cuts to keep the end grain at the ends as much as possible to reduce the risk of seeing the middle cross sections. We still have a few remnant pieces in the basement that I'm looking to do something with. Wendy has a few ideas, so we'll see how those turn out. 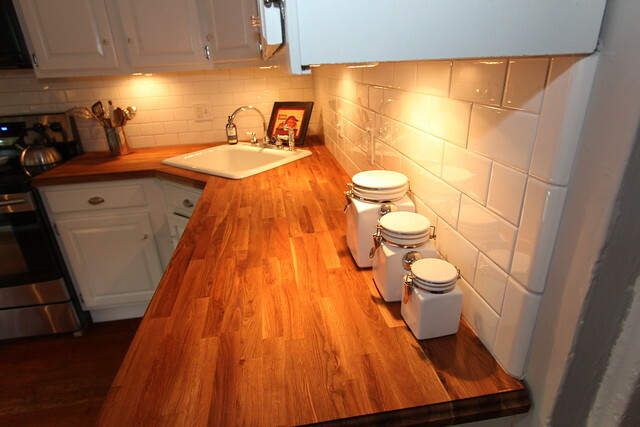 Do you have experience with IKEA butcher block counters? I'd love to hear if you have any similar stories or notes from your work. I'd also love to hear if you have any experience with butcher block from other manufacturers, especially Lumber Liquidators. I loved how the LL cherry looks, and I just wonder if their construction has similar issues to the ones we saw. Thanks Anne, we try to be as up front and honest as possible. I don't want to be the people are say "just go ahead and take on a massive project, it's all child's play," only to end up leading some poor reader into a nightmare scenario. People can get into enough trouble without my help and insistence. 2. What you put into a project is what you get out of the project. Trust us when I say that sometimes, the drive just isn't there. But we're lucky to have enough days in a month where our drive is there and we can knock things out. We installed the same countertops in our kitchen; bought two years ago and in Canada, and did not find many of the same issues. The wood pieces that made up the composite were solid all the way through. We didn't have many cuts as we were doing long runs, and were able to look at the bottom side of the counter to determine where knots might cause us problems. Too bad you had such issues. It does look beautiful in the end! That's interesting! I wonder if it has something to do with the suppliers IKEA uses in each area? Perhaps the Canadian suppliers are superior to those here in the states. Wouldn't actually surprise me. At any rate, I'm still glad we did it. Haha, you guys crack me up: "We're not 'thrilled' like the guests on an HGTV reality show where they just redid a room by putting live moss all over the walls, or like the homeowners are when the guest designers just spray painted a family heirloom." The counters and the whole kitchen transformation looks awesome. I'm so glad you guys go into these details about the project, like the PP I agree that some blogs can make the projects seem so simple, but they don't share things like the tile spacers popping out, etc. Thanks for keeping it real (and funny). 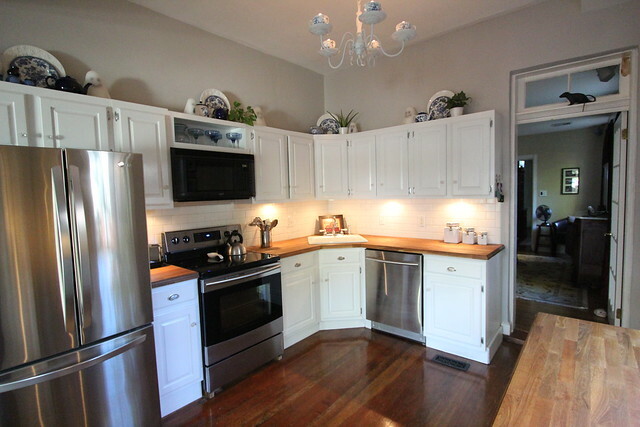 Would you mind sharing what you use to oil the countertops? We got the Stenstorp cart a while back and it has the same oak on the top, but we forgot to pick up the oil at Ikea and we are ~2 hrs away, grr. Thanks! Hah, glad you enjoy my somewhat random humor. I often think I'm way funnier than I am, occasionally I actually get a laugh. One thing you can count on from us, we'll always keep it real. After all, real is far more tragic and entertaining. We're working on a post that outlines how to treat the counters. But spoiler alert, we use food safe mineral oil, that's all. About 15 years ago, I had these very same counters installed in my kitchen. I had to be vigilant about spills and wetness, because of the potential for staining. We installed the same countertops in our kitchen last year and in joining two separate pieces for a long section I noticed that the thickness and width on one piece was close to a 1/4 inch less. It took a lot of filling and sandind at that joint to make it look somewhat good. Ver frustrating, but I can't complain too much when I consider the price. Thanks for sharing, Ashley. We totally agree with you. They weren't perfect, but considering the price we still think purchasing IKEA butcher block was a good decision! My husband and I have been looking for honest reviews on the Ikea butcher block counter tops and thankfully we stumbled upon your review. This is why blogging is so beneficial. You have given your readers an honest review, holding nothing back. I think your counter tops look amazing and I now we can say we are going ahead with this project with our eyes wide open thanks to you! Hi Cindi, I'm glad our review was helpful. 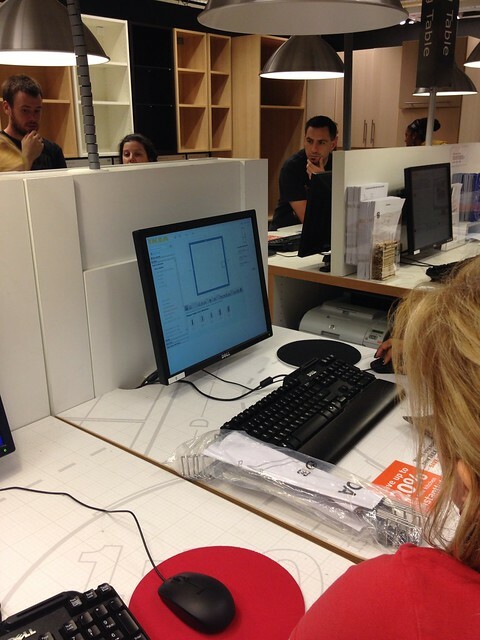 We're still very happy with our counters and we hope you'll be happy with your project as well. We purchased 2 Ikea countertops and both of them developed a crack in them within the first week of installation. I don't know what we are doing wrong as we oiled both countertops upon installation. We're ready to give up Oak and purchase something else. That sure stinks, Ken! Where did the crack develop? In the middle or the end? Is it possible the surface you're installing it on isn't totally level? I've read a few things that talked about the increased chances for board separation if it wasn't properly supported or on level cabinets. 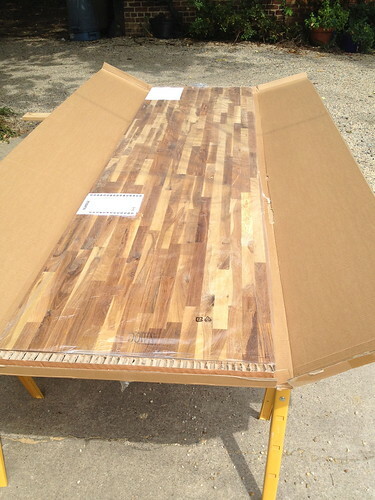 Have you looked into Lumber Liquidators' cherry butcher block? I have a friend who recently installed it and they love how it turned out. Hi Alex, The crack started at the end on both tops, and at opposite ends of the island. We're very discouraged, and a little reluctant to try again. I've got the same counters you have, and love the look of them. Mine are also solid all the way through. I have a couple of pieces of the 6' length that were cut basically in half and I didn't see any lamination or finger joints. I finished mine with Waterlox. It's a tung oil resin finish that really brings out the character of the wood. I don't cut on our counters and wouldn't recommend doing so with the Waterlox finish. With my left over pieces, I did what butcher block was designed for: cutting boards. I wanted to thank you for your post, as I've been looking into butcher block countertops, and investigating whether we should go the Ikea route, or spend a bit more for the likes of Boos. Your honestly is greatly appreciated. Your photos are also very helpful because we... um... have the exact same tile, very similar hardware, and similar cabinets. Hey, we have great taste, lol! Your pics gave me a very good idea of how the finished product would look, and something to show the Hubs. Thanks much! Thank you for your honest review.....I am a perfectionist, too, and the little details drive me nuts. It's just the way I'm wired. ;) Having seen your review, I think I will not be getting the wood countertops and stick with a tasteful laminate. Sorry for the late response, but you're quite welcome. We did find a problem or two, but overall we're still very happy with the counter tops. 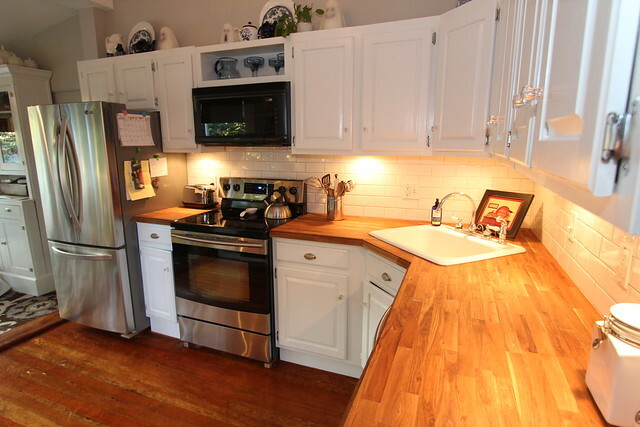 When we eventually do the full kitchen remodel (who knows who long from now), we'll likely not use butcher block, but I wouldn't be surprised if what we have end up somewhere else in our house, like a laundry room. 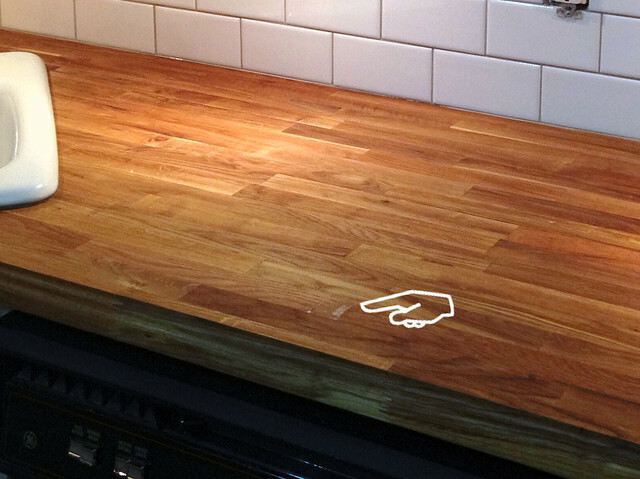 If you haven't already, be sure to check out the Lumber Liquidator butcher block. We've had a few friends install and it all really looks great. Hi! Hope you don't mind comments on an older post. Thanks for the honest review, especially since you did some extra things. I'm thinking I'm probably going to do this to update the kitchen in our house, assuming we'll be re-doing the whole thing at some point in the next decade. Our counter layout is pretty much exactly what you have in the first picture, corner sink and all - any wisdom on the cuts and joins needed to make that happen? We love comments no matter the age of the post. Good luck on your project, we hope all will go with your work. It wasn't the easiest thing in the world, but it's absolutely doable. Be sure to check out these two other posts that apply to your situation. www.oldtownhome.com/2012/9/11/Stick-a-Fork-in-Them-The-IKEA-Butcher-Block-Counters-are-Done/index.aspx This shows the cuts for the sink insert and cross piece. www.oldtownhome.com/2012/9/10/Fixing-Our-Crap-Cabinets-and-Starting-the-Butcher-Block-Installation/index.aspx This shows how we made the mitered cuts for the corner. After the deflating reality of the cost of granite/quartz, et al, I'm back to the Ikea butcher block idea. Loved your post!!! How have they held up thus far?? Like hot pots/pans sat on the counters? Staining? Since my kitchen is small (the entire run of my workspace is only 12'), I tend to sit stuff all over it when I'm in a cooking frenzy. I'd hate to 'forget' something and come back to a disaster! Even if it IS cheap, I shudder to think of having to re-do my counter top!! Also, I thought the butcher block was one of the few items you could order on-line, or do you have to go physically to the store? And Ikea is notorious for NOT having items physically in the store....that 3 hour drive you mentioned is exactly what we'd have to do if we go this route. Thanks for all your help/thoughts. NOW to figure out how ti install a farmhouse/apron sink in all of this!!! They've held up quite well. We're going to be doing a post in a the next little while that gives our honest opinion one year removed from install. But we're quite happy with them. And as far as the farmhouse sink, it's not going to be the easiest thing in the world, but I can imagine how it would be done. I'd make a template with an initial inserts that make the cut about 1/4" smaller than the actual cut, then use a plunge router to remove the material. Next, I'd remove the spacers and take off the remaining material with the straight router bit. Should give a consistent and smooth surface that can accept the sink. On the other hand, you can look up a local CNC shop that can cut the block for you based on the dimensions of your sink. I wish we had a farmhouse sink. 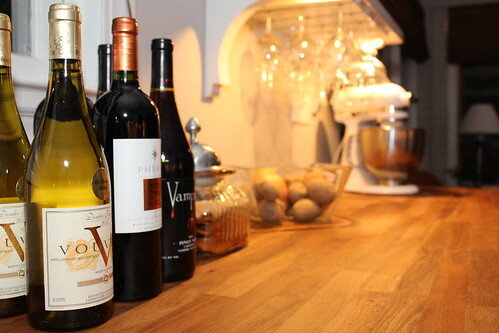 I I have ikeas oak counter top in my kitchen for 9 months now. Lately I've been noticing cracked here and there. What can I do to fix them and protect the wood from future crackes? Than you so much in advance. We've only had one crack and it hasn't gotten worse over the year. I think the key here is keeping it oiled very consistently. If you let it go too long and it dries out and cracks, it's hard to get it back into shape. 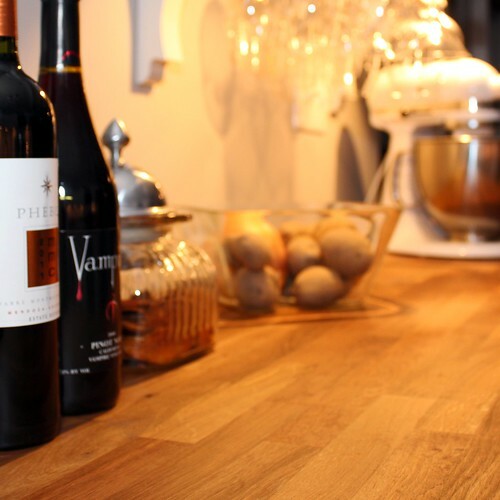 Make sure you're oiling your counter at least once a month. 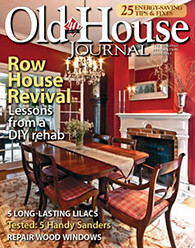 I just found your blog and have loved reading about your projects. DH and I are purchasing a home and planning to renovate like you have... and I love the idea of butcher block countertops! I was looking on the ikea website and found they have certain types which claim to be solid wood (Numerar) and another type which says it is a top layer of solid wood on particle board (Akerby) Do you know which one you bought? Of course, it could have changed from when you purchased the butcher block until now. But I would hate to get the solid wood and have the same problems you did! Thanks for your help! 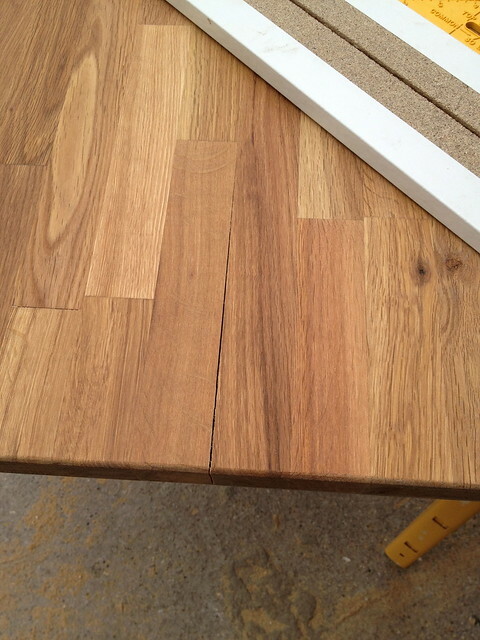 We used the Numerar, and it is solid wood, but at the same time, it's solid glued wood, rather than solid lengths. This adds to the overall stability of the product, but does make for the possibility of glue failure that causes issues. When you buy your material, be sure to inspect it before installing. Look for any problems, cracks, splits, bubbles, anything. If you see anything, exchange it for another piece. The kitchen looks great! I too am beginning the long haul of a remodeled kitchen and through blogging and Pinterest came across IKEA's butcher block counter tops. They are extremely affordable and I don't even want to use them as a counter top, but as an actual cutting board. I will be installing granite and want to install a large cutting board that has a skirt that hangs over the front about 6" right in the middle of the granite. This would match the look of a farmhouse sink and gas rangetop with the knobs on the front. Anyway, what I was wondering is if anyone has actually done a lot of cutting on them and how they hold up. I figure that even if I have to pull it out every 3-5 years and replace it, that for less than $200 I would have lots of extra to do that. Also, since food would be placed on them what stain and sealer is recommended? We haven't done a lot of cutting, but we've done a fair amount of food prep. Through our year+ of work on them, they haven't stained significantly. Anything that's been left on the counter pretty easily sands out, and then the next time we apply our oil/wax combo, it sort of seals it again. 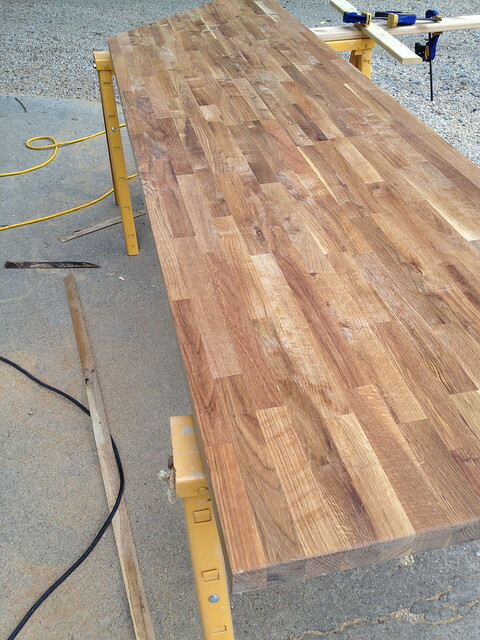 I think cutting on the surface will work find, but it all depends on the specific piece of butcher block you purchase. Since they are all wood, and some laminated pieces, every piece will be a little different and will have its own idiosyncrasies. Thanks so much for this. Today, my husband and I discovered the cost that our 8' x 4' butcher block island top will cost if ordered from our cabinet guy - 6.5K. Yowch! So we've spoken to a professional woodworker friend of ours and he's up for the task of working with unfinished materials even though he specializes in cabinets. Would you recommend buying 2 IKEA pieces and uniting them long-end to long-end in order to achieve the 8' x 4' top that we need? If you have the right tools and clamps I think joining the two pieces together should definitely be possible. However, since the edges are finished, the woodworker will need to cut the adjoining edges square, removing the little roundover detail. Then, I would probably biscuit join the two pieces together with a whole lot of glue. You'll probably need at least large cabinet making clamps that can accommodate the 4' total width. But you could probably buy both pieces of counter, all of the tools you need, all of the clamps, and still come in thousands below what you would have spent based on the cabinet guy's quote. Thanks for sharing. I love the look (and cost) of these countertops. Great information. The last post was most useful. My cabinets are 29" deep. I will either have to order IKEA's 36" depth countertops, which will cost $300 for delivery (not available in stores and I will need three of them), or a buy an extra 25" depth, in order to cut and join to fit. Since you worked with the product, do you recommend I bite the bullet and order the larger, or can they easily be cut and joined. We have a kitchen from the 60s that is on life support right now and no funds for the complete overhaul it needs. I'm not a fan of butcher block but cheap is always good. What I'm curious about its whether these can be sealed permanently or if oiling them is the only option. Thanks. Thanks, Alex, for your post. We installed the Numerar countertop last year and it's stood up well. We had it cut to size by a man in our neighborhood who has a woodshop out of his garage. He made two cuts to cut the large rectangle into the smaller one we needed, and then cut a portion of the long side offcut to make a routered edge. In all three cuts, there was solid wood. We seal it regularly (quarterly?) with mineral oil. No rings and a magic eraser keeps things good for us. Thanks for the review. I'm currently renovating a house to be our new studio and we're about to get these exact countertops. One question, it looks like you sanded the whole countertop. What sort of finish did you use on it afterwards? I installed an IKEA butcher block countertop for one of my customers a while back, it was the solid birch top at $199 CDN. I was extremely impressed by the quality of the product. I only had to make one cut where a wall was out of square. I would definitely recommend the product. I just finished installing an oak butcherblock counter from IKEA. Many difficult cuts and angles. I am very impressed with the quality of the product. It does seem to be warping, but it is slight and I think I can pull it back to level. One thing to note, the thickness is now 1.125 inches, not 1.50. Still plenty thick. Ikea butcher block sounds good for my needs. How can I get a rough estimate on price per sq. ft. Installed oak 1 1/2 inch. If it's not in my budget I'll have to come up with another option. Thanks. My name is Tony Long, i am an engineer. I like high-tech, with the best Counter Depth Refrigerator for my house. Thank for this article, so helpful! I love the look of your counter top and we have the same corner angle as you do, where it doesn't meet at 90 degrees, but angles across. How did you handle the corner piece(s)near your sink? We don't have a sink it would be a large surface area so I'm trying to figure out what will look best there. I was looking to do this to my countertops and I also have corner sink like you have. Do you have overtop picture to see how you cut the wood for the corner sink. I have that same design and trying to get different ideas to do the sink spot. I used the IKEA butcherblock in my bedroom and the lumber liquidators cherry in my mudroom. In all honesty, I like the finish of the IKEA one better. Considering the amount of money we spent on the LL cherry vs. IKEA, one would think there would be a significant quality difference. There isn't. 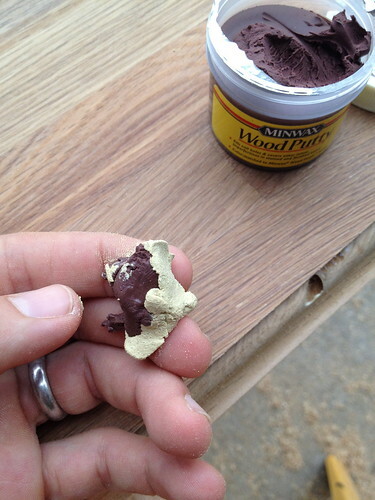 There are even sections in my LL cherry that were filled With epoxy or filler. I was very disapponted when we installed them. I am trying to decide about a normal vanity top for our kids bathroom, or buying an IKEA butcher block top. I love the look of the wood, but am nervous about the upkeep. My kids are older (9-14 years old), so that should help. Maybe. Any thoughts would be helpful?!? Thanks. Few years old, but your blog is very helpful. I undertook this butcher block assignment of mine for purposes of a desk. 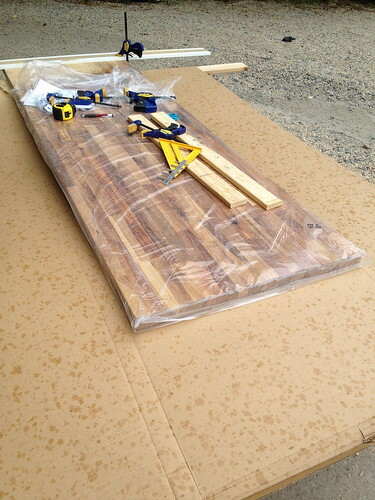 Ordered birch plank fro Wayfair which actually gets it's supply from Rapid City, SD. And Black Hills area. Yes, I too have noticed after sanding and staining (twice due to a uneven application the first time) that these boards cannot be solid 100% birch without defect. The underside is full of nots, one hole, and uneven tone. While the ends appear one and not two separate glued and planed together they are just like yours in every way. I will not have to cut mine though will be limited to one side. You get what you pay for.